An estimated one in seven HIV positive individuals is unaware of their status in Chicago, that’s about 4,300 people and Latinos are disproportionately affected by HIV. In 2010, it was estimated that new HIV infection rate among Latinos in the United States was more than three times as high as that of whites. On Saturday, June 27th marks National HIV Testing Day where organizations across the city of Chicago will encourage people, especially Latinos to become proactive about their health and get tested. This year we highlight hard working individuals who work tirelessly in communities across the city to combat stigmas associated with HIV/AIDS and urge change. Meet Ricardo Albarran, Testing Together coordinator at Howard Brown Health Center; Carlos Orengo, manager HIV/STI Services at Howard Brown Health Center, and Patricia Aguado, director at Proyecto Promover who are all champions pushing to educate the Latino community about HIV/AIDS. 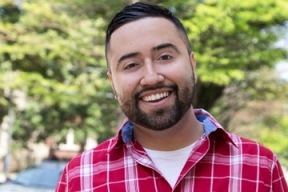 Born and raised in the Little Village and West Lawn neighborhoods, Albarran is the first in his family graduate college, earning a degree in Bachelor of Science in community health from University of Illinois at Urbana-Champaign (UIUC). What led you to Howard Brown Health Center? As a teenager, I visited Howard Brown Health Center’s Walk-In Clinic and also their Broadway Youth Center. What really made me return was how welcoming and comfortable the staff made me feel. Everyone I met with really seemed to love the work that they were doing and created a space for me where I didn’t feel judged or different. It was also great to see that they serve the lesbian, gay, bisexual, and transgender community, but that Howard Brown also welcomes any and all people who want to access affordable, high-quality health care. I told myself then that I wanted to work at Howard Brown one day, so after I graduated from college, this was the first place I applied to and I’ve been here ever since. Please describe to me the impact your role at Howard Brown Health Center has had in your personal life as well as the Latino community? Working at Howard Brown has given me a first-hand look at how HIV affects our communities, including our Latino community. According to the Centers for Disease Control and Prevention, Latinos accounted for 21% of new HIV infections in the United States in 2013. That means that we still have a lot of work to do in order to stop HIV and it all starts by us eliminating the stigma and talking openly about it. I have talked to my mamá and papá about the work that I do, how it is affecting our community, and why it’s important to talk about this with others. They have then continued these conversations with the people around them – family, friends, and coworkers. So my role at Howard Brown has led to those around me being more informed and unafraid to have open conversations with other’s about HIV. Hopefully that conversation chain will continue so that ultimately our entire Latino community can be able to talk about HIV openly, without stigma. As National HIV/AIDS Testing Day occurs on Saturday, what would you like the Latino community to know about the importance of become their own advocate by getting tested? Ask yourself, “When was the last time I was tested for HIV?” If you are sexually active and if it has been more than a year or if it has been so long that you are unsure, National HIV/AIDS Testing Day can be a great day for you to receive a test! As a Latino, I understand the struggle that can come with getting tested for HIV in our community. However, it is important to know what is going on with our health and make sure we keep up with knowing our status. When you feel ready, you can always stop by Howard Brown Health Center, where we offer a full panel of tests for sexually transmitted infections, including HIV, on a very affordable sliding scale with no appointment needed. There are many other places in Chicago where you can receive testing as well – as long as you ultimately get tested for HIV and know your status, that’s what matters! Through your work with the Latino community, what continues to be the struggle for Latinos getting tested? Stigma surrounding HIV and sexual health is one of the main struggles for Latinos getting tested that I have seen through my work. Growing up, I don’t remember there being a time where my mamá and papá talked to me about these topics – I think that this is because it can be difficult or uncomfortable for Latinos to talk about HIV and sexual health due to cultural norms. This acts as a barrier to have those conversations that can ultimately lead us to get tested. There is also a language barrier when accessing health care services. That is why it is very important that health care centers have staff who are bilingual, so that there can be direct communication and information about HIV and the importance of testing. At Howard Brown Health Center, we have bilingual staff members available during a person’s visit, from start to finish. This includes our Spanish-speaking front desk staff, medical assistants, to HIV test counselors, and medical providers, who work together as a team to provide the best culturally competent health care possible. What I enjoy the most is meeting the people who come to Howard Brown for testing. I have had the privilege of serving hundreds of people in the community – listening to their life stories, helping them through their concerns, and informing them of ways to prevent HIV or providing information on living a long, healthy life with HIV. Being able to make their visit to our health center as welcoming and comfortable as possible when receiving HIV test results is a top priority of mine. So to me, this is more than a job – it is a service that is important for our community and I am very thankful to be a part of that. What message do you have for the Latino community when it comes to getting tested? Chicago native, Orengo fell in love with helping people after working several jobs in customer service. After attending Northern Michigan University and Loyola University, he found his footing working at Howard Brown Health Center. I first heard about Howard Brown Health Center when I was about 17. Growing up in Chicago, I had no idea that there were clinics dedicated to LGBTQ health. However, I was able to learn more about this community based organization due to Horizons, an LGBTQ youth group. Through them I starting to understand that I needed to take care of my health as a gay Latino man, and make the most of my life. HIV/STIs were never discussed in my household, other than using condoms and that changed when I starting working at HBHC. When I was about 24, I got my first job at Howard Brown Health Center as a Patient Services Representative. I became completely immersed in the community and started to comprehend how important one’s sexual health as well as overall health was. Quickly I became involved in research, like Pre – Exposure Prophylaxis (PrEP), and outreach, and understood that I could make a change in the community. Being at the agency for five years has been an eye opening experience and I love the work I do here. After being at HBHC for five years, I have done reception work, research, outreach, and now being the Manager of HIV/STI Services, I continue to see how my work impacts the community. Every day I get patients thanking me for providing services, linking them into care, or directing them in the right direction on how to navigate tough conversations with partners. In my personal life, I am the friend that will remind friends to get tested routinely, supply them with condoms, and even chat with them about other prevention tools such as: PrEP. In addition, HBHC has helped me with setting my own goals in place. One thing I would like to become in the future is to become a medical provider. I see the need for medical providers that are Latino and gay, and are able to relate to the community. I would like the Latino community to really understand that there are people out there who can help you with the process of getting tested and educate you on your overall well-being. In the Latino community, language might be a barrier in receiving services, but we are here to help! Sexual health is only one part of what makes you, you, but it’s an important one that will constantly evolve. Having an open dialogue with partner/s about their most recent HIV/STI test, condom usage, and what to do if someone is HIV positive, is very important and should constantly be on the patient’s mind before they have a sexual encounter with someone. Empower yourself through education and take control in protecting yourself. I believe there continues to be a certain idea about a clinic setting and how off putting it can be, even intimidating. Another struggle is language. They fear that if they come into a clinic they won’t be able to discuss openly and freely, hindering dialogue about these important topics. At HBHC, this is not the case. We have staff that are monolingual and we have several different options for translators if necessary. We want services to be available for anyone who needs them. The thing I love the most about my job is the opportunity to enlighten someone about their health and how much they can do if they just educate themselves. When I see a person, get that ‘aha’ moment, gives me a deep internal satisfaction. I would like the Latino community to know that knowing your status is really important. It’s not like it once was in the past, having to wait up two weeks to know your status. You can get tested through a finger prick, or an oral swab, and those results can be readily available to you in less than 20 minutes! Plus, there are so many places for you to go and receive these services. This could be at a clinic, at a bar, a store, and even in the convenience of your own home through testing technology that you can purchase at a Walgreens. An additional thing I would like for people to know is that if you do test HIV positive, this is not a death sentence. There are so many people that want to help you lead a long and healthy life. Case managers, counselors, and doctors, are available to provide you with services. I hope that people can understand the importance of getting tested and knowing your status, regardless if it’s negative or positive. What led you to Proyecto Promover? I’ve been in the field of HIV for 15 years. For the majority of that time, I was a Clinical Social Worker providing mental health services/counseling to individuals at the Cook County Health & Hospitals System’s (CCHHS) Ruth M. Rothstein CORE Center. At CORE we operate 2 half-day bilingual clinics where all providers are fluent in Spanish. By virtue of this, I got to know most of our Spanish-speaking clients and was able to witness firsthand the stigma and fear that exists about HIV/AIDS within our Latino communities. It was through this formative experience that I was compelled to go back to school and get my PhD in social work. 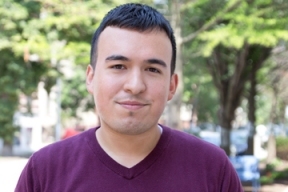 I wanted to learn how to find ways to address and answer questions specific to the barriers to testing and care that I was seeing in our Latino HIV-positive communities. 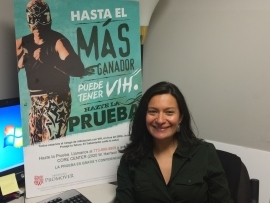 CCHHS’ Proyecto Promover came about as part of a grant through the Health Resources and Services Administration (HRSA) specific to HIV/AIDS education and outreach to Latino subgroups. We chose to focus on community and individual interventions for Mexicans and were funded by HRSA in Fall 2013 for 5 years. The overarching aims of Proyecto Promover is to reduce stigma related to HIV by increasing HIV education, HIV testing and ensuring that people are linked to and stay in care if HIV-positive. Please describe to me the impact your role at Proyecto Promover has had in your personal life as well as the Latino community? Proyecto Promover is the next step in what has to date been my life’s work; a commitment to advocating and working with Latinos who are impacted by HIV. Proyecto Promover is at the forefront of reducing stigma by increasing HIV education, normalizing HIV testing, linking and retaining HIV positive Mexicans in care. Knowing your HIV status is power: the power to take care of yourself and the power to take care of those you love. There are numerous barriers to Latinos getting tested for HIV/AIDS: lack of HIV education, fear of dying, not believing they are at risk, not knowing where to go to get tested, fear related to what will happen if they are positive and not knowing how they might pay for treatment, traditional gender norms and machismo, symptom driven health care access behaviors (meaning if they do not feel sick, they will not engage in care. ), and other competing responsibilities-mainly work. Mexicans that we see are often immigrant or first generation and may or may not be documented. Therefore, meeting basic needs, such as housing, food and work are priorities. If our people do not work, they do not get paid. Sadly and unjustly, many of our people have few if any worker protections, so taking a day off to get tested and engage and stay in treatment if positive can become a question of staying healthy or earning money to meet basic concrete needs. Also, what we see unique to Mexicans that end up engaging in care at CORE is that they end up getting tested at a later stage of the disease, often after being hospitalized. For many of our HIV-positive Mexicans, their first HIV test comes with an AIDS diagnosis because people do not seek out care until they are incredibly sick, for many of the reasons mentioned above. The knowledge that what we are doing can help inform future projects looking to understand and address the barriers to care of our HIV-positive Mexicans. We are one of few programs across the nation specifically focusing on Mexicans at-risk and/or infected with HIV/AIDS. There is significant potential for change. At the Cook County Health & Hospitals System and CORE Center we provide services to everyone regardless of your ability to pay or documentation status. Fear should never be an obstacle to being healthy. It’s normal to be afraid to be tested, but get tested anyway. Good health means knowing your HIV status. If you are positive, HIV is not the end of the world. There is treatment available for you; treatment that will keep you healthy and will allow you to live a normal life. If you would like to learn more about Howard Brown Health Center, visit www.howardbrown.org or call 773-388-1600. If you would like to learn more about Proyecto Promover, call 773-999-9808.